City in the Prussian province of Hesse-Nassau. There was a persecution of the Jews at Wolfshagen, near Cassel, during the Black Death in 1348; and Hesse-Cassel is mentioned in the same year as a scene of persecution. In 1610 Landgrave Moritz accorded protection to the Jews of Cassel, on the payment of 1,000 reichsgulden. In 1635 only one Jew, Benedict Goldschmidt, was living at Cassel; in 1647 the brothers Abraham and Simon Goldschmidt. In 1649 the Cassel Jews were forced to listen to weekly sermons for their conversion, each Jew—even women and children—being obliged toappear at the town hall. Once, when sixteen Jews and their rabbi were celebrating the Day of Atonement and neglected to attend the sermon, the land-gravine caused them to be imprisoned and severely punished, and expelled the rabbi. In 1651 the weekly sermons to the Jews were reduced to six a year, at the instance of the Jewish community. Every Jew without a "privilege" had to pay one ducat for every night that he stayed in Cassel—an ordinance that was renewed in 1673. In 1749 exceptions were made only in favor of the traveler who had papers from the government certifying that he was there on official business, in which case he was allowed to remain four days without payment. In 1751 the poll-tax on native Jews was fixed at four groschen, and that on foreign Jews at eight groschen. In 1766 the Jews were nevertheless ordered to dwell in the city during the fairs, even the district rabbi and the presidents being included. They were not allowed to buy houses except in the Unterneustadt, nor were they permitted to rent them. The next year twelve streets were named in which they might reside. In 1773 a Jews' street was laid out; and as late as 1820 it was ordered that no Jews should live in any of the principal streets of the Altstadt, and that they be entirely excluded from the Oberneustadt. In 1775 Jews were allowed to have open shops in the city. 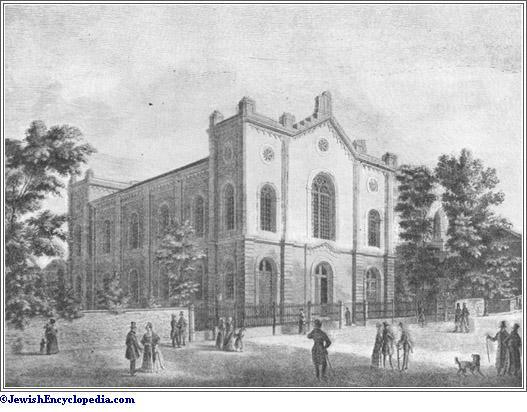 The new synagogue was dedicated in 1839. The seat of the district rabbinate was transferred from Witzenhausen to Cassel in 1772. 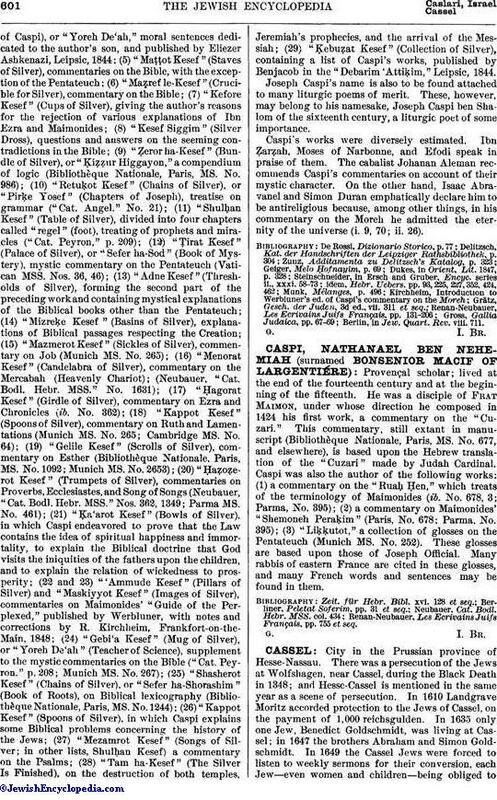 Among the rabbis were: Hirsch Kirchhain (died 1779); Joseph Hess (1780); Joseph Michael Kugelmann (about 1790); Loeb Meier Berlin (died 1814); Dr. Ph. Romann (1836-42); L. Adler (1852-83); and I. Prager. 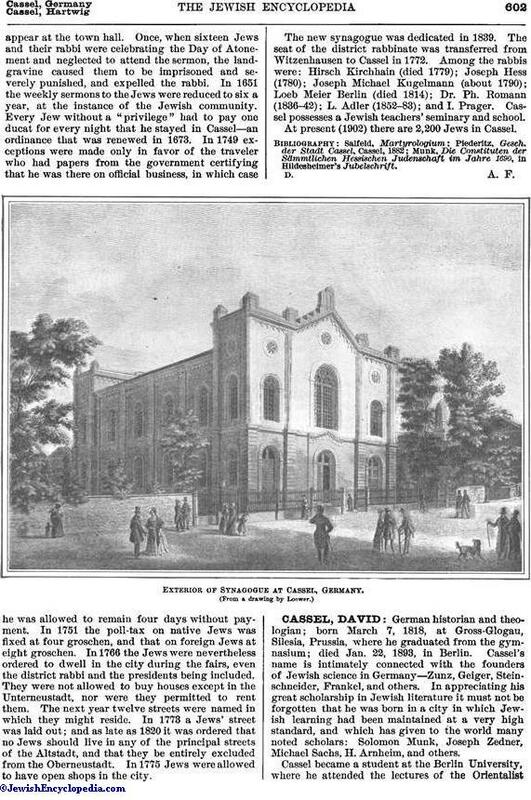 Cassel possesses a Jewish teachers' seminary and school. At present (1902) there are 2,200 Jews in Cassel. Munk, Die Constituten der Sämmtlichen Hessischen Judenschaft im Jahre 1690, in Hildesheimer's Jubelschrift. Exterior of Synagogue at Cassel, Germany.